One of the possibilities for reducing the intake air temperature is to install a cold air intake. However, another possibility is to reduce the heat conduction from the hot engine to the intake manifold by thermally separating the two. By replacing the steel intake manifold gaskets with an insulating spacer, heat conduction to the manifold can be greatly reduced. The best material for the spacers has a low thermal conductivity, high compressive strength, is able to withstand up to 300 degrees F (~150 degrees C), and is affordable. Phenolics, with excellent insulating properties, high stiffness, and the ability to withstand 500+ degrees F (260 degrees C), are commonly chosen for similar applications. Additionally, the coefficient of thermal expansion of a phenolic is similar to that of aluminium, which helps to reduce sealing problems in this particular use. When compared to the 0.025 inch steel gasket it replaces, a quarter inch thick phenolic insulator will conduct 200-1000 times less heat! Although the insulation benefits increase with thickness, ¼ inch (6.4mm) sheet was chosen because this is the thickest that can generally be used with stock mounting studs and bolts. Several companies, including Ford Motorsport, offer insulators for 5.0L Mustang owners as well as for carburetted applications - just look through a Summit Racing catalog!. The most common thicknesses are 3/8 -1 inch and prices are generally in the US$50-$60 range. However, as is usually the case when it comes to performance mods beyond intakes and exhausts, nothing was available for my Mazda V6. 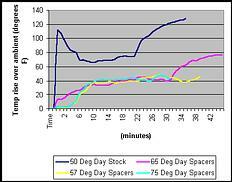 This is one reason I decided to look into the possibility of designing and fabricating some insulating spacers for myself (and also anyone else who was interested). Building upon a previous spacer design, I was able to create a CAD drawing of the item and got several quotes for making a production run of approximately 50 sets potentially utilising everything from standard milling and machining to abrasive water jet cutting. I found a competent local company and after working through some initial fabrication problems, I was able to get sets made that were of very high quality. Too bad you can't see them after they're installed! I now have insulators to suit the Mazda 1.8L-2.0L-2.5L K Series V-6 engines, with more than 75 sets so far being sold for this engine. I am currently considering expanding the coverage to include some other vehicles in the sport compact segment (Honda, Nissan, Toyota, etc) - please contact me for more details. Installation of a set of insulators should take approximately 3 hours and can be accomplished by the average home mechanic with common tools. I did the install outside in my driveway and had no major problems. I was initially concerned about the amount of jury rigging that might be required, but was pleasantly surprised that for the most part, it is a bolt-on job. Having seen the unsubstantiated claims of numerous bolt on parts suppliers who say that their product will give you "up to XXXX extra horsepower! ", I was determined to be able to show data that the insulators indeed worked as claimed, or didn't work, if that was the case. I have used three different methods of testing the effectiveness of this mod - dyno numbers, temperature data, and quarter mile drag strip results. I wish I could say that I have a chassis-dynamometer in my garage, but such is not the case. I do have a G-Tech Pro, but I have not been overly impressed with its accuracy or repeatability. So how did I do the testing? I heard about a computer program called The Home Dyno while I was lurking on a Honda/Acura list (gotta know what the competition is up to!). In a nutshell, you make a recording of your spark plug pulses taken from an inductive pick-up on one of your plug wires during a 1500-7500 rpm acceleration run. You then download the pulses into your PC and The Home Dyno is able to construct a power plot using the relative time differences between the pulses. Being a mechanical engineer by day, I was somewhat doubtful about the method, but after giving it some thought, I decided to purchase the program and give it a shot. After using it for the past several months, I have been absolutely amazed by The Home Dyno's accuracy and repeatability. The program outputs a graph as well as a load of data that can be dumped into Excel or other spreadsheets and then manipulated. It also corrects for altitude, weather conditions, driveline loss and aerodynamic drag. In addition to the graphical output, the HomeDyno also outputs several pages of numerical data. It really is neat little program and I highly recommend it, especially for those all wheel drive vehicles that cannot so easily be dyno'd. During my dyno runs, I was always careful to pay attention to vehicle weight (there is a scale near my home), weather conditions, and I did a run in each direction then averaged the results to take care of any road grade and wind discrepancies. My runs before and after the installation of the phenolic spacers were done on the same day with all variables as close as I could manage, ie warmed up engine, same stretch of road, etc. According to the plots, I gained approximately 7hp and 11 ft-lbs of torque using the spacers over the majority of the power curve. I can make no claims as to the accuracy of these results, but they do seem reasonable. My best time prior to the spacer install was a 15.360 at 88.469 mph with a 60 foot time of 2.209 seconds. This was during last year's season where I ran 29 races at Thompson Drag Raceway in north-eastern Ohio. The first time back at the track this year I ran a best of 15.262 at 89.315 mph with a 60 foot time of 2.282 seconds and with the insulators as the only additional modification. The temperature during both races was about 55 degrees F (13 degrees C). To summarize, I was ~0.1 seconds quicker and ~1 mph faster, all with a .073 second slower launch. According to my dyno plots, I gained up to 7 horsepower and 11 ft-lbs of torque over the major portion of the power curve. My best time at the track was ~0.1 seconds quicker and ~1 mph faster. The cost for a set of two spacers is US$87 (at the time of writing). Contact: sales@outlawengineering.com"
Pull the fuel pump relay and then start the car. The car will run for a few seconds and then die. This is to relieve pressure in the fuel runners connected to the intake manifold. The fuel pump relay is located under the plastic cover behind the battery. Remove the intake manifold, airflow meter, and elbow from the throttle body. Remove the spark plug wires from the rear cylinder bank and looms. Look for oil. Remove the PCV hoses from the throttle body. Remove the throttle cable from the mounting bracket by squeezing the plastic tabs, then remove it from the throttle body. Remove the electrical connections to the VRIS and remove the VRIS solenoids with bracket from the manifold. Carefully remove only the vacuum hoses that are directly connected to the intake or throttle body. Most of the 682 (or so!) vacuum hoses between the engine and the firewall do not need to be disconnected. Obviously, pay attention to where they go. Mazda was kind enough to mark some of them with coloured dots to help installation. Remove the mounting bolts for the PCV pipe that runs behind the manifold. Disconnect the fuel line from the fuel rail. Be careful not to lose the copper crush washers. Also disconnect the fuel return line and vacuum lines to the fuel pressure regulator. Now before you get all excited thinking you're ready to remove the manifold, Mazda has left a surprise for you. There is a bracket that holds the EGR solenoid valve that is attached to the rear head and the intake manifold. You must remove the nut that attaches it to the manifold. It is tricky, but perseverance will pay off. The bracket is very stiff and there seems to be no reason for this bolt except to foil your plans to easily remove the manifold. Needless to say, I did not replace this bolt when I reassembled the engine. Now you can remove the 4 bolts and 2 nuts attaching the manifold to the heads. Carefully lift the manifold off the engine and disconnect the coolant hoses to the throttle body and any other things I forgot to mention. You will lose a small amount of coolant from the throttle body. Remove the manifold from the engine bay, rub your aching back, and admire your handiwork. You may want to stuff rags or paper towels into the intake ports to keep debris from falling in there. 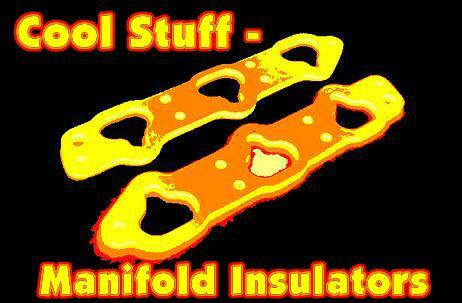 You will now want to clean the sealing surfaces on the head and intake manifold. I scraped them with a putty knife to remove old gasket material. Be careful not to gouge the surface. It is now time to port match the spacers with the cylinder head and intake. I designed the insulators to be slightly smaller (~.5mm) than the intake ports so that port matching could be done. It is interesting to note that the heads for the different engine sizes seem to be nearly identical. You will notice, however, that the port in the intake manifold is smaller than the intake port in the head. The difference in size is greater in the smaller displacement engines. I used my cordless drill and sanding barrels to match grind the spacer with the port in the cylinder head. This was easier and went more quickly than I had expected. Since the intake runner is smaller than the intake port, I used this opportunity to remove some of the cast surface at the exit of the runner to better match the intake port. Once you are satisfied with the fit of the insulators, put a light coating of gasket sealant on both sides of the spacers and position them on the heads. I did not use intake gaskets when I reassembled the engine. 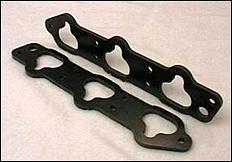 I'm not saying that you cannot, but the mounting studs may not be long enough for spacers and gaskets. 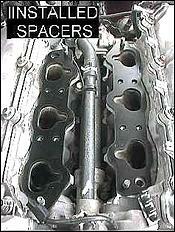 Replace the intake manifold, taking care not to disturb the position of the spacers. Remember to reconnect the coolant hoses to the throttle body during this step. Replace the manifold bolts and nuts and torque them down to 14-18 lb-ft (19-25 Nm). On 2.5L engines, you will need to loosen the 2 bolts attaching the rigid fuel line to the engine. This should give you enough play to make it reach the fuel rail. If you are still short, remove the rubber insulator from the fuel line bracket and it should fit fine. Now the words we love to hear, "Installation is the reverse of removal." Once everything is back together, start the car, listen and look for leaks, and go for a ride. When you're done, place your hand on the manifold. Much cooler.